My pressure waves started the evening of June 11th and continued to become longer, stronger and closer together over the night and next morning. I spent most of the day taking short walks, snuggling with our puppy and napping comfortably. We went to the hospital when my waves were 4 minutes apart, roughly a minute long for 1.5 hours. I listened to the Easy First Stage track all afternoon and on the way to the hospital, staying comfortable and relaxed. Upon arriving at the hospital, we were in triage for roughly 2 hours. Shortly after being admitted, I entered transformation. Thanks to Hypnobabies, this time seemed to fly by! It seemed like only 10 minutes before I started having involuntary pushes. My hypno-doula Laura and a nurse helped me get into the tub, where I easily let my body involuntarily push out my baby girl! The human body is AMAZING when you let it do its job! 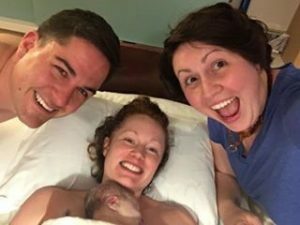 Thanks to Hypnobabies, our hypno-doula Laura Lulic-Timpane Hanstad of All Things Birth, my husband and the support of the hospital staff, my birthing time was the easy, wonderful experience I deserved!